Norfork Lake's fall fishing pattern is under way. The lake is finally starting to cool down, but additional cooling is needed to bring on the full blown fall pattern. 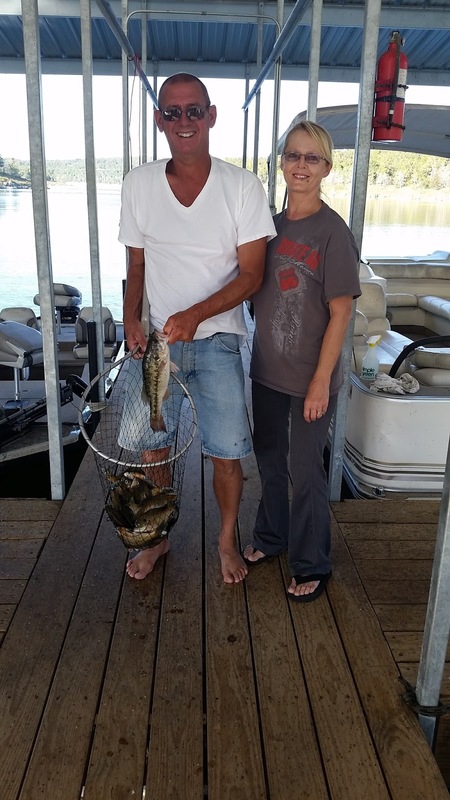 Striped bass are biting well up in the coolest water at the Arkansas / Missouri border. Live shad (big ones) are working the best set at 12 - 18 feet, but trollers are starting to pick up a few fish on big swim baits. The stripers up north seem to be cruising in the shallow water and not necessarily in the old river channel. 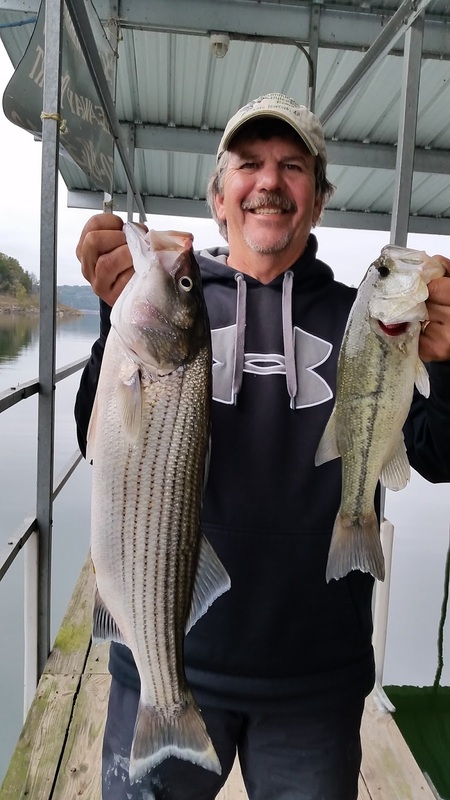 A few nice stripers and big hybrids are starting to show up on the big flats from the Cranfield area up to the Red bank area. Vertical jigging with a spoon is working the best as the fish are hugging the bottom in 30 - 40 feet of water. The fish are showing up all day long starting at sunrise up to sunset. This doesn't mean they are biting all day long. Over the last week I have caught stripers and hybrids at sunrise, at noon and tonight I found them around 4PM. I guess you need to fish all day long to be there when they are biting. Just take a cooler along with some water and sandwiches. :-) I try to vary the time I'm fishing so I can know what's going on different times of the day. It's a fun time of year when you never know when the bite is going to happen. 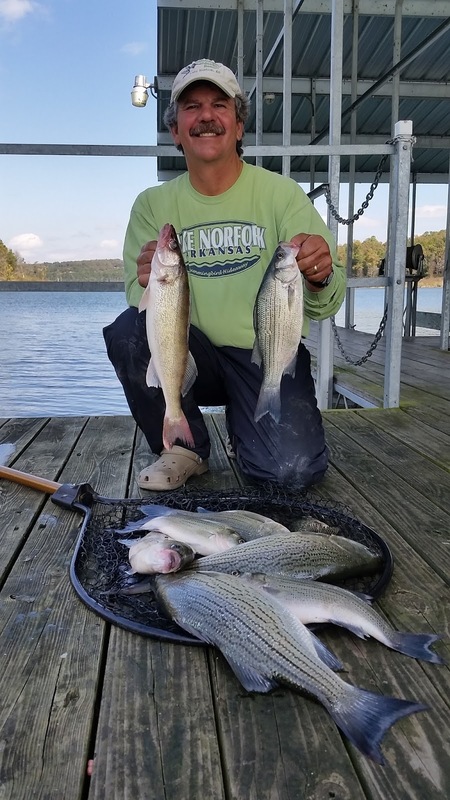 I have a fishing prediction that over the next week the lake will cool to the upper 60's, the lake will finalize its turnover and the striped bass will start to show up on the large flats starting in the Robinson area up to Missouri and also up towards the Fouts area. Inaddition topwater action will increase. One of the main reason I like to vertical jig with a spoon this time of year is that all species will be found in the same areas and at the same depth. I also like flat fishing, but it can be a little tedious so patience and good electronics do help a lot. Over the last week except for one day up river fishing with gizzard shad, I have been vertical jigging flats in 28 - 40 feet of water. 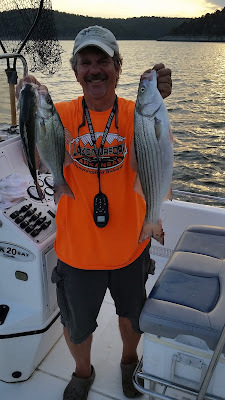 This evening, as well as, yesterday morning I landed walleye, white bass, largemouth bass, crappie, hybrids and stripers. What more can a fisherperson ask for. Big schools of fish are just starting to show up and this will be more commonplace as the water continues to cool. The best places for crappie are on brush piles that have been sunk in 25 - 40 feet of water. The crappie will be anywhere from 10 - 30 feet down. The hardest part of crappie fishing at this time is finding the best depth to catch the fish. Live minnows are working great, but vertical jigging a small spoon or jigging small plastics tipped with a minnow is also working very well. If it is blue gills you are wanting, work the same brush piles as for crappie, but use crickets for the bait. Largemouth bass are all over the place. You can find them suspended 15 - 20 feet down off of the deep bluff lines. They are also laying on the bottom early and late in the day on the shallow banks. 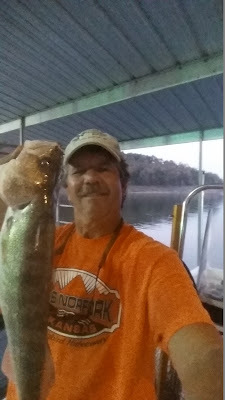 You will also find some nice fish hanging around the crappie brush piles. Crank baits are picking up some nice suspended fish and plastics of all kinds are working for the bottom feeders. The bass hanging around brush are hitting spoons or drop shot rigs. Norfork Lake is falling slowly due to one generator being run for a good portion of the day and currently the level sits at 552.84. The surface water temperature has been on a roller coaster ride. With the very hot days we have recently had the temperature has risen slightly and this evening was around 75 with the morning temperature around 73 degrees which is a couple of degree rise over the last couple of days. The creeks and coves and main lake flats are stained with the rest of the main lake is clear.